LAGOS, Nigeria (CNN) -- A man "angered" by Manchester United's defeat to Barcelona in the final of the Champions League killed four people when he drove a minibus into a crowd celebrating the Spanish side's victory, police in Nigeria have told CNN. 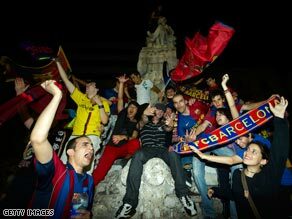 Barcelona fans celebrate in the city's Las Ramblas thoroughfare early Thursday morning. Ten people were also injured in the incident in the town of Ogbo, where the driver was subsequently arrested, a Port Harcourt Police spokesperson said. "He was displaying his anger at his team losing the match. The driver had passed the crowd then made a U-turn and ran into them," spokesperson Rita Inomey-Abbey said. Both Manchester United and Barcelona have a large fan base across the African continent, with millions tuning in to watch European football on a weekly basis. Meanwhile, more than 100 people were arrested in Barcelona city center in the early hours of Thursday morning following the Catalan team's 2-0 victory in Rome in the final of Europe's top club competition. Police arrested 119 young people after violence flared at a special celebration party in Place de Catalunya near the Las Ramblas thoroughfare, while 238 people suffered minor injuries. City officials estimated the damage at up to 100,000 euros ($140,000) as the youths attacked police with bottles and damaged shops, parks and public utilities such as lamp-posts. The trouble took some of the gloss off the achievement of Barcelona, who became the first team to win the Champions League, Spanish League and Spanish Cup titles in one season. Manager Josep Guardiola led the club to glory in his first season in charge, ending a period of three years without a trophy.